Writing a column a week is proving to be tough. I told Seema, my editor, that I had no ideas. I was desperate. This is the result. Not happy with it. Feel that I should have provided more value-add; more insights. What is a fresh insight on grief? Answer that question for me. Last week, I attended the funeral service of my friend, Yvonne. It was beautiful with touching eulogies, soaring music from the choir and a certain quiet dignity. This is different from the Hindu funerals that I have attended, with overt crying and other expressions of grief. Among the fishing villages in Tamil Nadu, there are (or used to be) professional wailers who are paid to weep and sing the folk song called oppari. These come to the home of the departed, beat their breasts and sing improvised songs. A typical one begins Kathirikai engaluku, Kailasam ungalukku, which means, “We eat brinjal. You go to Mount Kailash.” The alliteration works better in Tamil. I tried researching other death rituals that are not religious but couldn’t come up with any. This then is the paradox of life. You go for health check-ups; you do the right thing; you plan and go on a pilgrimage; and then suddenly or gradually, a person you cherish is snatched away either through illness, accident or disaster. Google’s Person Finder has a page titled “2013 Uttarakhand Floods”, with two simple headings: “I am looking for someone” and “I have information about someone”. Online “virtual memorials” allow the living to remember the dead by creating a page dedicated to their loved one and inviting friends and family to write on the guestbook. Grief counsellors can help draw out the pain through therapy and techniques. There are several books that help with grief. When Bad Things Happen to Good People, by rabbi Harold Kushner, is a classic that helps loved ones cope with illness, cancer and other “bad things”. It attempts to answer the question, “Why God? Why did it happen to her/him?” Rabbi Kushner wrote the book after his son died of a prematurely ageing disease called progeria. It is perhaps most useful for those grieving for a loved one’s untimely death. Joan Didion’s elegant and spare memoir, The Year of Magical Thinking, describes her grief after her beloved husband died. It is unsparing in description and does not attempt to prescribe how to cope. Instead, it mulls on marriage and union. “Marriage is not only time: it is also, paradoxically, the denial of time,” says Didion. “For 40 years I saw myself through John’s eyes. I did not age.” This could well apply to many a partnership. Leo Tolstoy began his epic Anna Karenina with the phrase, “Happy families are all alike; every unhappy family is unhappy in its own way.” This is both true and untrue. Grief, I believe, is universal; and arguably unique to humans. It is how we make sense of our destiny. We grieve because we must; because we don’t have a better model; and because it is the only way that we know how to move on. Psychologist and professor Susan Berger identifies five ways that people grieve. When faced with tragedy, people react by becoming nomads, memorialists, activists, normalizers or seekers, she says. These descriptions make sense. Nomads wander the world in search of a coping mechanism when they lose something or someone. Memorialists erect monuments, both real and virtual, to preserve the memory of their loved ones. Activists seek to change the status quo. They help to influence policy or policing, particularly after losing loved ones to guns or terrorism. Normalizers play ostrich. They act, and pretend, that things are normal; that life goes on. The seekers go on spiritual voyages to try and make sense of what happened. Shoba Narayan is looking for organizations such as Goonj.org that are working in Uttarakhand. Moving piece. 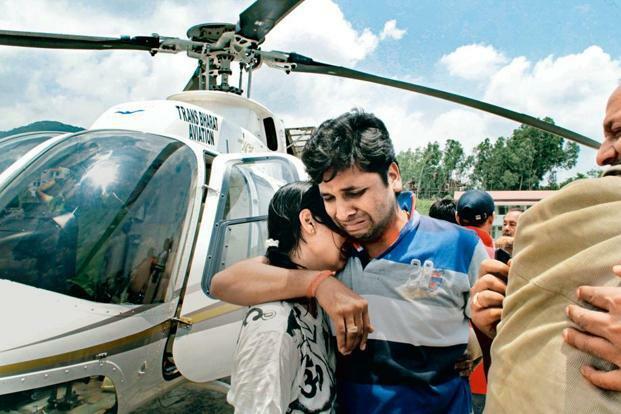 While on this, pls read my post – Uttarakhand tragedy and the “Asafal yatra”!!! Thanks anand. I enjoyed your piece. Grief hits everyone hard, no doubt about it. Different people have their own signature grieving style – either riotously wail, beat chests or behave `very well’ resisting tears behind dark shades. Eventually it has the effect of erasing your sense of loss and letting you come to terms with it. It’s purely therapeutic, in that sense though it goes down the road of anguish. Another aspect of grief is you break down only when people talk to you about it. The best way to share someone’s grief, however desolate, is to silently mourn with the distressed. Similarly never attempt to distract when grief is fresh or dissuade one from crying out or even mildly sob. Sorrow makes us all children, no point in reminding about how to `appear brave’ before children or elders. Let it all sink in and then as time rolls by, the sorrow slowly dissipates completing the natural course of therapy. They get resilient of what they had overcome. And then there is what I call as grief paradox. Most people when live and kicking, are cynical towards spirituality and philosophy. Then find it pretty much uncool, occult or even meaningless drivel. But grief has the ability to turn the tables on them and soon they all buy copies of Kathopanishad, where the Yama, the Hindu God of Death demolishes the myth of death to Nachiketas, the true seeker. That makes it sensible to read up on such great discourses while you are up on the brighter side of life, basking in glory. A sort of smart gear-up to face the other side because every daybreak has a nightfall catching up, fast. If inclined, you might want to read the story of the awakening of a spent nation written in verse at http://www.nirbhayasindia.com Would keenly await your comments.